The Alcohol Facts Poster displays some of the important facts about alcohol as a drug. 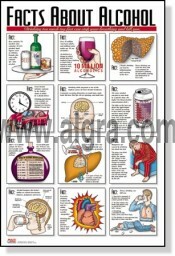 It explains to common minor side effects alcohol has on the human body. It also reminds people not to drive under the influence. This poster is a great tool to educate people about the effects of alcohol in a classroom setting or health related facility.